After a short delay in updating news following the recent death of Jean Marsden, we are not hopefully back up and running. Im sorry for the delay. The Rail Accident Investigation Branch (RAIB) has released its report into the fatal accident which occurred at Mexico footpath crossing, near Penzance on 3 October 2011. At around 15.50 on Monday 3 October 2011, a pedestrian, Mrs Nicholls, was struck and fatally injured by a train on Mexico footpath crossing, near Penzance in Cornwall. The footpath crossing was not equipped with warning lights or alarms and pedestrians were required to look and listen for approaching trains. The pedestrian’s ability to see approaching trains was restricted by line curvature to a maximum of about 190 metres and a ‘whistle board’ was situated 348 metres (around 15 seconds running time) from the crossing to provide additional warning. Train drivers were required to sound the train’s warning horn when passing this board and the driver of the train involved in the accident had done so. On approaching the crossing round the curve, the train driver had observed a person standing to the side of the line and had sounded the warning horn again before the train reached the crossing. However, the pedestrian then attempted to cross and was struck. In the few seconds immediately before the accident when the train was in view, the pedestrian either misjudged the speed of the approaching train or misjudged her position in relation to the approaching train, having probably seen the train too late to have time to make a reasoned judgement about whether she should cross. It is not known why the pedestrian was apparently unaware of the train horn that was sounded around 15-16 seconds before the train reached the crossing. Either the horn was inaudible to the pedestrian because of the train’s distance from the crossing when it was sounded or it was heard by the pedestrian, but not associated with a train. * The positioning of whistle boards at level crossings across the main line railway network is not optimised to local conditions; and train horn testing is not mandated following relevant accidents or incidents. Three recommendations have been made to Network Rail regarding changes at Mexico footpath crossing that will improve pedestrians’ warning of approaching trains; expediting the marking of decision points at level crossings and achieving consistency in the way that sighting distances are measured; replacing the warning provided by train horns at whistle boards with audible and/or visual warnings at crossings, and, where this is not reasonably practicable, optimising the positioning of whistle boards to local conditions. One recommendation has been made to RSSB regarding enhancing industry’s existing processes for gathering incident data to enable a full evaluation of risk at level crossings to be made and for reviewing the effect of the change that was made in April 2007 to sounding a single tone only of the train horn at whistle boards. One recommendation has been made to First Great Western to propose a change to Railway Group Standards to mandate the objective testing of train horns after incidents and accidents where the sounding of the train horn was either required by the rule book or employed by the driver during the event. Birmingham saw the opening of one of the rail network’s greenest buildings today as a new base for railway staff officially arrived at platform 1 at Birmingham New Street station. The new building, known as the Lamp Block, sits on the west end of platform 1 at the station rising above Hill Street and Navigation Street. 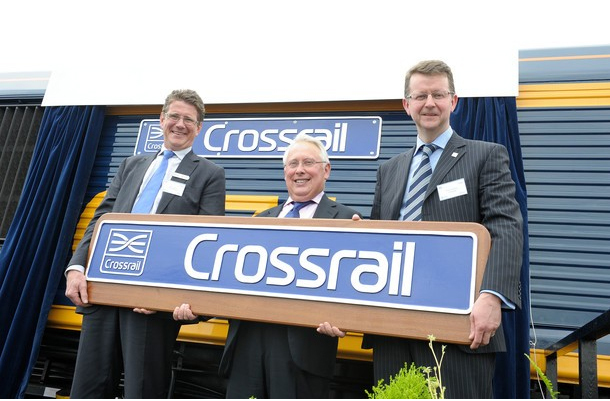 It was delivered by Network Rail for CrossCountry and is now the base for over 450 of their train crew who run CrossCountry services across Great Britain. Built in less than a year within a very challenging environment between a rock face and the railway, it sits on the site of a 19th century depot which supplied gas lamps to workers who maintained the railway tunnels either side of New Street station. The new facility is expected to receive a BREEAM (Building Research Establishment Environmental Assessment Method) rating of excellent. It boasts a number of sustainable features including solar panels to generate electricity, a solar thermal system to generate hot water, sub-metering for all water, heating and cooling to monitor energy consumption and an energy efficient lighting system. Sharing the space with the solar panels is also the building’s green roof, containing over 14 different species of plant to contribute to the area’s biodiversity and reduce rainwater run off into the drainage system. This renewable technology is expected to reduce the building’s carbon emissions by 10%. Over 85% of all non-hazardous construction and demolition waste for the build has either been re-used or recycled. Network Rail has announced the secondment of Virgin’s chief operating officer, Chris Gibb, to the company. Working collaboratively with Network Rail, Virgin Trains has agreed to this secondment for the remainder of this year to work with the Network Rail team on improving the performance of the infrastructure on the southern end of the West Coast Main Line. Mr Gibb will retain a number of his current duties and responsibilities for Virgin Trains and will continue to undertake these alongside the role in Network Rail and will report to Robin Gisby, Network Rail’s managing director of network operations for the duration of his secondment. He will work very closely with Jo Kaye (the route managing director of the London North Western Route, which encapsulates the West Coast Main Line) and her team, using his 31 years of railway experience to bring unique insight to the task ahead. The West Coast Main Line has seen a dramatic increase in traffic over the last five years and the infrastructure is now delivering an unacceptable level of reliability that Network Rail and Virgin Trains are determined to tackle. Freightliner Ltd, the intermodal rail freight operator, has made a significant investment in new replacement cranes at Southampton Maritime Terminal to boost reliability and support the forthcoming berth enhancements at the port. Liebherr Container Cranes Ltd, the leading manufacturer of container cranes in Europe, have recently completed production of two rail head gantry cranes in Ireland which are currently being shipped to Southampton Port and due for installation in August 2012. The enhancement follows complementary additional schemes for new cranes at Birmingham and Manchester. The new cranes will improve the lift rate with the capability to span 13 roads in comparison to the 7 roads that the existing cranes can facilitate. The crane design also allows for substantial additional height to provide access for the day-to-day integrated and unique Freightliner/DP World operation of double and now triple high straddle carriers directly into the Freightliner terminal. The cranes also replace the existing requirement of ancillary machines to support the overhead cranes. It is envisaged that the cranes will eventually increase lift capacity by up to 80%, although the overall capacity will be increased in stages. The initial increase will meet the new demand driven by the recent gauge enhancements that has allowed 9’6 high cube containers to be hauled on standard wagons to the Midlands, Northwest and Scotland. Further infrastructure improvements are also planned for the rail terminal, specifically to add more roads and increase track length to coincide with the Southampton Port’s scheme to upgrade 201/2 berth. The new cranes will provide the opportunity to completely overhaul and improve the operations in Southampton and generate enhanced working methods with DP World Southampton. Freightliner currently operates 14 daily round trip services from Southampton to 10 inland terminals throughout the UK, 7 of which are owned and operated by Freightliner. The new Wolverton Railway Station building is now complete and was official opened on Thursday, 21 June 2012. The opening ceremony was attended by the Mayor Cllr Catriona Morris, members of the Wolverton Steering Group, representatives from London Midland, Network Rail, the design and construction team and the council as well as local councillors and people who have been involved with the project. A specially designed plaque was unveiled as part of the ceremony by the Mayor. The building has been designed to be sympathetic to the historic Victorian buildings around it whilst incorporating a modern and airy feel. The specialist timber beams are on show inside and outside the building under the slate roof and the glass wall panels ensure the interior receives natural light. The modern yet traditional look of the station building is another key achievement in the rejuvenation of Wolverton. The construction of the station building began in June 2011 and as it is now completed, the responsibility for the building will now be handed over to Network Rail and London Midland. The development work has been funded through the government’s Growth Area Fund, and project management was undertaken by Milton Keynes Council. Rail users are now able to use the new facilities of a new ticket office and booking hall, toilets and a seated waiting area. Additional work will continue around the station building which will include an improved footpath along Stratford Road leading to a ramp and new steps directly opposite the station. The existing steps down the embankment will remain open once work is completed. London Midland passengers are set to benefit from faster journey times and extra services as final testing clears the way for timetable improvements later this year which will see the Class 350 sets authorised for 110mph running. During the Summer, London Midland is conducting a series of final tests in advance of introducing 110mph running on some of its services into London from December. Journey times to London will reduce by up to half an hour and, as a result of increased capacity on the line, London Midland will be introducing an additional service each hour, off peak, between Milton Keynes, Rugby and London Euston. Journey times from stations in the Trent Valley area, including Rugeley, Lichfield Trent Valley, Tamworth, Atherstone and Nuneaton, to London will reduce by up to 32 minutes – shaving just under an hour from the return journey from Nuneaton for example. This improvement follows the introduction of hourly Sunday services to the capital from TrentValley stations in April. The main line between London and Rugby is the most intensively used bit of railway in Europe. London Midland is modifying its fleet of 30 class 350 trains to run at the faster speeds which, in turn has the added benefit of creating more train paths into London. From 2014, London Midland will take further advantage of the increased speed by introducing seven brand new trains onto the route, adding eight new services during morning and afternoon peak periods into and out of the capital. The speed increases and extra off-peak services will be introduced from Monday, 10 December 2012. Alstom Transport has received an order from the Swedish Public Transport Authority AB Storstockholms Lokaltrafik (SL) for 46 new Coradia Nordic regional trains. This order worth €440 million is part of a frame agreement signed in 2002 between Alstom and SL. It brings the total number of Coradia Nordic trains ordered by SL to 129. This order will allow SL to replace a part of its aging fleet and extend its network. Alstom will start to deliver the 46 trains to serve the lines of the greater Stockholm area in 2016. “This new order from SL is a strong sign of trust and confidence in Alstom Transport’s know-how and solutions to secure a sustainable public transport service for the city of Stockholm,” said Henrik Anderberg, Managing Director of Alstom Transport in Sweden. “We are convinced that the arrival of new and modern train sets in the commuter train network of the greater Stockholm area will contribute to increase our competitiveness and provide a higher level of customer satisfaction”, commented Anders Lindström Vice President of SL. Coradia Nordic is an EMU-type (Electric Multiple Unit), six-car, regional train that can run at a speed of 160 km per hour. The train designed for SL will be equipped with the latest ERTMS1 signaling technology and meet all the latest interoperability requirements. Its distributed power optimizes the braking and acceleration of each carriage reducing energy use. With an approximately 95% rate of recyclability, the train is environmentally friendly. Built to stand up to rigorous winter conditions, operating at -35% C, Alstom Coradia Nordic regional train is particularly well-suited to Scandinavian climates. Coradia Nordic regional train is designed to meet all passengers’ requirements in respect of comfort, access and mobility. Its lower floors and absence of steps facilitate access to passengers, especially those with reduced mobility. With roof-mounted traction equipment, the train offers larger space for comfortable seating. Coradia Nordic regional trains for SL will be manufactured in Alstom’s centre of excellence for regional trains in Salzgitter in Germany. Since 2002, Alstom has sold 239 Coradia Nordic regional trains in Sweden. Crossrail announced on 22 June 2012 its intention to award the main construction contract for the Western Ticket Hall at Tottenham Court Road. to Laing O’Rourke Construction Ltd In line with European procurement rules the contract is subject to a ten-day standstill period. Tottenham Court Road Crossrail station will be directly connected to the neighbouring Tube station allowing passengers to interchange between Crossrail and London Underground services. Following completion of the works, a major over-site development will be constructed above the Crossrail station. When it opens Crossrail will link the West End to Canary Wharf in 12 minutes, Stratford in 13 minutes and Heathrow in less than 30 minutes. Thames Gateway Minister, Bob Neill, officially opened a new £13.5 million freight link from the North Kent Line to the former Lafarge Cement Works at Northfleet on 21 June 2012. The new freight line will initially be used to transport excavated material from the construction of Crossrail’s tunnels from London by rail rather than by road. Exactly one year after his first visit to the then empty brownfield site, the Minister viewed the significant progress that has been made over the last 12 months to reinstate the railway, construct a new connection to the North Kent Line, and receive the first trainloads of Crossrail excavated material from London. The length of the new freight line is around 2.25km with 4.75km of new track provided. At Northfleet the excavated material will be transferred to ship for the final part of its journey along the Thames to a new RSPB nature reserve at Wallasea Island in Essex. Thames Gateway Minister Bob Neill said: "I'm delighted to be here at the celebrations for the reopening of this vital rail line. Infrastructure such as this is essential in allowing businesses to move goods and will help propel growth in this area. I saw this very site one year ago and the progress has been astonishing. Today I've been along the line and seen what it will do for the local economy. This project is now going to provide support for the building of Crossrail, proving that the Thames Gateway is well and truly open for business." At the peak of tunnelling up to five freight trains a day will be operated by GB Railfreight from Westbourne Park in west London carrying a total of 7,000 tonnes of earth. Over 10,000 tonnes of excavated material has already been transported from London to Kent. Assembly of Crossrail’s next 1,000 tonne tunnel boring machine (TBM), Elizabeth, has today commenced at Limmo Peninsula in east London. During the next four months, components for the 150 metre long machine will be transported to the Limmo worksite from Tilbury Docks and reassembled before being lowered in sections into two huge shafts. Once fully assembled below ground, Elizabeth will begin constructing the first of Crossrail’s two eastern running tunnels between Docklands and central London. Workers have reached the temporary bottom of the two huge launch shafts and have commenced work on sprayed concrete lined tunnels to connect the two shafts. The larger of the two shafts is 30 metres in diameter and will be 44 metres deep when completed. Limmo Peninsula, located adjacent to Canning Town station, is a key Crossrail worksite from where Elizabeth and Victoria will be launched. The machines will construct Crossrail’s longest tunnel section running 8.3 km (5.16 miles) to Farringdon station via Canary Wharf, Whitechapel and Liverpool Street. Victoria is due to commence tunnelling this winter and completed her factory testing last week. This means that four of the eight Crossrail TBMs have now been manufactured. Crossrail will build a new dock and conveyer system at Limmo to take the excavated material from the eastern tunnels to Wallasea Island in Essex by ship. The excavated material will be used to create Europe’s largest manmade inter-tidal nature reserve. The dock will also be used to receive more than 120,000 concrete segments that will line the tunnels. The concrete segments will be transported by ship to Limmo Peninsula from a pre-cast concrete segment factory at Chatham in Kent. Crossrail and development partner Cardinal Lysander have submitted a joint planning application to the London Borough of Islington and the City of London Corporation for an over-site development above the western entrance of Farringdon Crossrail station. The 207,000 sq ft development, located at the corner of Cowcross Street and Farringdon Road, will comprise six storeys of high-quality office space, with retail units at street level. The building has been carefully designed to integrate with Crossrail’s operating station and will also improve local views of St Paul’s Cathedral. Farringdon is at the heart of the Crossrail route and will be a key link in bringing passengers directly from within Greater London and beyond to the business hubs in the City and Canary Wharf. Located at the only intersection between Crossrail and Thameslink, Farringdon will directly connect with three of London’s five airports, providing a railway connection between Heathrow and Gatwick. When complete, over 140 trains per hour will flow through the Farringdon interchange. Farringdon Crossrail station will comprise two platform tunnels, each the length of two football pitches, linking two new ticket halls. The western ticket hall will be shared with Thameslink services, and will have an entrance on Cowcross Street, directly opposite Farringdon Tube station. The private sector funded over-site developments will commence during the latter stages of work to construct Farringdon Crossrail station. Crossrail will commence services in 2018. ScotRail has expanded its Business Direct service to enable employers to offer Season Ticket schemes to their staff. The train operator hopes the change will help organisations enhance their sustainable performance, and encourage staff to leave their cars at home. ScotRail has urged leaders of public and private organisations across Scotland to get in touch to discuss Season Tickets. Transport Minister Keith Brown said: "ScotRail’s Business Direct Service already makes it much easier for businesses to manage their travel budget and ensure they get the best value tickets. That not only benefits those businesses that sign up but also pays dividends for the wider population by helping get cars off the road and improving our environment. I welcome ScotRail's innovative thinking on this service and look forward to seeing it develop further." ScotRail is searching for a second group of apprentices following the success of the rail industry’s first ever Modern Apprenticeship in Customer Service scheme. The train operator is looking for up to 12 candidates aged between 16 and 23 to work through the 18-month programme. Successful candidates will gain valuable experience in three key customer service roles – station booking office, ticket examiner and on-train hospitality host – based in Aberdeen, Edinburgh, Glasgow, Inverness or Perth. They will achieve a Level 2 VQ in Customer Service and have the chance to undertake their Gold Duke of Edinburgh’s Award, as well as the prospect of a full-time career with ScotRail. The first Modern Apprenticeship in Customer Service programme was launched with a group of 11 apprentices in March 2011. Throughout the 18 months, the scheme has gained MSP support, praise in the Scottish Parliament and also saw the transport company pick up Best Newcomer at the 2011 Scottish Apprenticeship Awards. Bombardier Transportation has announced that it has signed a contract with the San Francisco Bay Area Rapid Transit District (BART) for the supply of 260 new rail cars. The order is valued at approximately $631 million US ($647 million CDN, 502 million euro). The contract includes a first option order for 150 cars that BART intends to order on 25 June 2012 and additional options which, if exercised, would bring the total number of cars ordered to 775 and the total value of the order to approximately $1.5 billion US ($1.6 billion CDN, 1.2 billion euro). Designated by BART as its “Fleet of the Future”, the new cars will be used to replace BART’s entire existing fleet as well as for system expansion. They will offer a range of new features such as more doors to make boarding faster and easier; more priority seating for seniors and people with disabilities; more comfortable seats; bike racks; energy efficient lighting; interior and exterior digital displays showing passenger information; an improved public address system, including automated announcements; and improved onboard security cameras. The cars will be assembled at Bombardier’s manufacturing plant in Plattsburgh, New York. The Plattsburgh facility is Bombardier’s center for rolling stock production in the United States. In operation since 1995, it has produced more than 3,000 passenger rail cars and locomotives now in service across the United States. The cars will be powered by highly reliable Bombardier Mitrac propulsion equipment with energy-efficient inverters. The cars' onboard systems will be integrated by Bombardier's industry-leading Mitrac train control and management system with internet protocol technology. Bombardier’s Propulsion and Controls business unit located in Pittsburgh, Pennsylvania will supply the propulsion and control equipment. Bombardier is transforming how people get around every day. Worldwide, more than seven billion trips are taken on Bombardier metro cars every year, from Boston, New York, Montreal, Toronto and Mexico City to London, Paris, Berlin, Delhi and Shanghai. Bombardier’s current North American metro car orders include 706 new cars for Chicago, 420 cars for Toronto, 468 cars for Montreal, and 300 cars for New York. BART began service in 1972 and today connects the San Francisco Peninsula with Oakland, Berkeley, Fremont, Walnut Creek, Dublin/Pleasanton and other cities in the East Bay with five lines, 104 miles of track, and 44 stations. The system has an average weekday daily ridership of 370,000. Its fleet of 669 rail cars includes 439 cars that have been in service since the system opened and were refurbished by Adtranz (now part of Bombardier) in the late 1990s and early 2000s. The Class 456 units are currently operating with the Southern franchise and will transfer to South West Trains in January 2014. They will then undergo a high quality refurbishment costing over £10m which will include making the interiors similar in appearance to the class 455 units already operating with South West Trains. The Class 456 and 455 units will operate in multiple and the introduction of these extra carriages will mean five, six and eight car trains can be lengthened to run as eight, nine, 10 and 12-car services. These new trains will deliver a significant increase in capacity on one of Europe's busiest networks. This is the second phase of a capacity enhancement programme that will see the introduction of a total of 108 additional carriages on the South West Trains network between May 2013 and December 2014. Phase 1, which was announced in December 2011, will deliver an additional 60 carriages through the refurbishment of former Gatwick Express Class 460 Juniper vehicles, combined with refurbished trains from South West Trains fleet. The refurbishment work will be undertaken by Railcare Ltd at their facility in Wolverton near Milton Keynes. ScotRail has been named Public Transport Operator of the Year at the Scottish Transport Awards. The result capped a successful night for the train operator – winning a total of four titles at two of the transport industry’s most prestigious awards ceremonies. At the Network Rail Partnership Awards, ScotRail won the Sustainable Excellence title for its environmental performance during 2011/12, and the Investing in People award for its staff training and development schemes. And ScotRail’s Perth-based train driver Ricky McLeod – who has never been sick, late or involved in an operational incident in a career spanning more than three decades – collected Frontline Employee of the Year at the Scottish Transport Awards. Alex Neil, Cabinet Secretary for Infrastructure and Capital Investment, said: "I congratulate ScotRail on their victory at the Scottish Transport Awards and look forward to seeing how they can build on this success to carry on providing ever improving services for passengers. Scotland is enjoying a renaissance on the railways with record passenger numbers and that is something we want to see continuing to grow. We all benefit when more people are using the train, through a better environment, less congestion on the roads and improved connectivity, and I am delighted to see that ScotRail are doing what they can to help that happen." ScotRail’s Inverness Team was highly commended at the Network Rail Partnership Awards for its work - alongside Network Rail signallers - to boost safety by enhancing monitoring systems at level crossings. The demand for rail travel from Manchester’s Piccadilly station has increased so much that car drivers are regularly turned away from the multi storey car park because it is full. Network Rail is tackling the problem by creating an extra 263 spaces. Built in time for the Commonwealth Games that were held in Manchester in 2002, the existing multi storey car park and level deck alongside the station have 592 spaces in total. The extension is being built using pre-cast concrete. When completed the entire car park, including the original building, will be clad in a structural steel that weathers to a natural brown colour over a period of time. It has been used successfully on other buildings in Manchester and is seen as a good choice of material for a structure adjacent to the brick warehouses and the station. It also provides savings for Network Rail as it is a low-maintenance material that doesn’t need painting or cleaning, which will help the company meet its cost efficiency targets. The existing car park holds a Park Mark safer parking award, and Network Rail will apply for the entire car park to be re-assessed so that motorists can park in the knowledge that they are leaving their cars in a safe and secure environment. The extended car park will be entered into the British Parking Awards and will also be considered for a number of design and architecture awards. To coincide with the Queens visit to Nottingham on 13 June 2012, one of the Notingham trams was unveiled in a Jubilee livery. One of the city’s trams has been wrapped in an eye-catching Jubilee livery. It made its first public appearance shortly before the Queen arrived in Nottingham with the Royal party which include the Duke and Duchess of Cambridge on board the Royal Train. The tribute is the result of a partnership between Nottingham City Council, The NET Concession company, Tramlink Nottingham and the NET operator Nottingham Trams Ltd and will be unveiled by Councillor Jane Urquhart, Portfolio Holder for Planning and Transportation. Following an unveiling ceremony, the bright red tram remained at the Royal Centre stop for the remainder of the Queen’s visit to the city centre before entering service later in the day. Secretary of State for Transport Justine Greening has officially unveiled major improvements at Southampton Central station, marking the 250th station to benefit from the National Stations Improvement Programme (NSIP). Established three years ago with £150 million of Government funding, the cross-industry NSIP has brought better stations to millions of passengers in England and Wales, exceeding original targets and expectations. NSIP aimed to deliver improvements to a minimum of 150 stations between 2009 and 2014. Southampton Central represents the 250th station to benefit from the project, and the number continues to rise thanks to the success of the rail industry in attracting external funding for local improvements. The ￡2.4 million renovation at Southampton, completed by Osborne, was funded by NSIP with additional contributions from South West Trains, Southampton City Council, and the Railway Heritage Trust, representing in excess of ￡1 million of additional money to the original NSIP investment. Jake Kelly, Customer Service Director for the South West Trains and Network Rail alliance, along with Tom Smith and John Pengelly, co-chairs of the NSIP Board, welcomed the Transport Secretary to the refurbished station. They will be joined by representatives from Southampton City Council and the project architects among others. A unique piece of railway heritage has been unveiled to passengers at Blackfriars. Fifty four stones from the original Victorian station, each engraved with destinations served by the London, Chatham and Dover Railway (LCDR), have been preserved in a newly opened area of the Blackfriars concourse. The stones list destinations as diverse as Bickley, Marseille, Gravesend and Venice, as the LCDR advertised Blackfriars’ links to towns and cities of the south east, and the business capitals of Europe via cross-channel steamers. 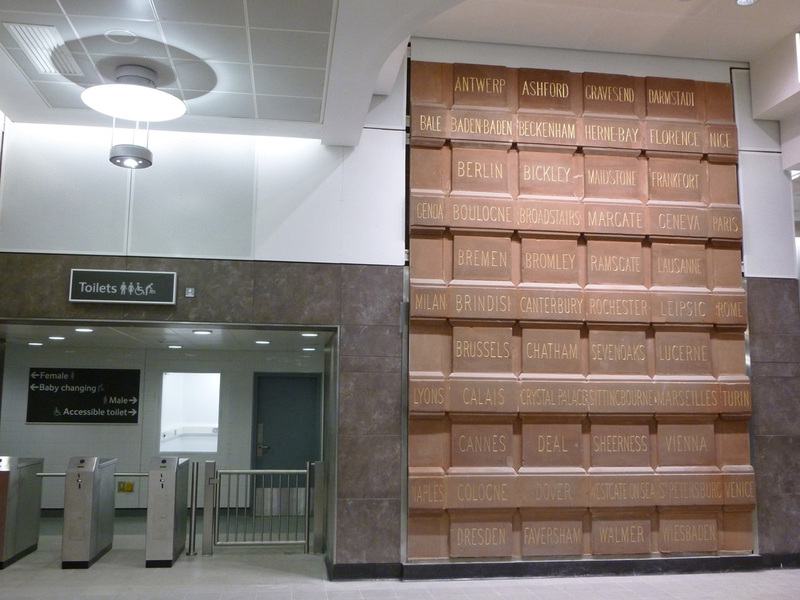 The restored destination stones are displayed in Blackfriars' new northern concourse, where First Capital Connect and Southeastern customers are benefitting from a new ticket hall with direct links to the London Underground station next door. Toilets in the new concourse building also opened over the weekend. Escalators to platform level and new shops within the station will open for use over the coming months. First Capital Connect customer services director, Keith Jipps, said: "We're thrilled that one of the original heritage features of Blackfriars station - the destination stones - have been preserved and revealed and complement our new, modern ticket hall which is now open to the public. Thameslink route customers love this evolving station and the new features being completed." Passengers have seen massive changes at Blackfriars over recent months as new areas of the station opened for use. In December Blackfriars became the only station in London to span the Thames as a new entrance opened on the south bank of the river. This was followed by a new London Underground station, which opened in February following a three year closure. Since last month 700 extra trains per week have been serving Blackfriars following the opening of two new platforms. The new station will be fully operational by summer 2012, with work complete on all entrances, platforms, lifts and escalators. Work on the bridge reconstruction will continue into the autumn, without any impact on passengers. Swansea railway station has a new look thanks to a multi-million pound investment and renewal programme. More than 2 million passengers use the station each year and will see a much fresher and efficient station as a result of the work. Funding for the £7m project came from Network Rail, the Welsh Assembly Government and the National Stations Improvement Programme. Network Rail tied in its renewal work at the station to increase the scope of the project, which was delivered by station operator Arriva Trains Wales. The official opening took place on Monday 11 June, when Welsh Government Minister Carl Sargeant AM visited, along with senior figures from Arriva Trains and Network Rail. Work continues behind the scenes to make repairs to the roof and damp proof the building. More than 2,400 people have been caught and charged with breaking the law at level crossings by three Network Rail/BTP enforcement vans across London, the south east and Scotland. The figures have been released as Network Rail announced it will be rolling out 10 more vans across Britain this year to deter more motorists and pedestrians from taking a risk by darting across after the lights and klaxons have begun or even swerving around barriers. All routes will have at least one van with London North East and Anglia, three and two respectively, which have more than 2,800 level crossings. Despite having a highly visible presence close to level crossings, British Transport Police officers, who operate the van, have caught and charged 2,452 people with various offences ranging from jumping the lights and driving through crossings as barriers come down to striking barriers, careless and dangerous driving and yellow box junction obstructions. The van on the Wessex, Sussex and Kent routes has been in operation since January 2011, with the vans operating in north London, Anglia and Scotland since the summer 2011. They are deployed at various level crossings across the routes where there are highest levels of misuse and locations allow. Whilst the vans are still relatively new in operation Martin Gallagher, head of level crossings for Network Rail says they are helping to make a difference: “The vans are just one part of a much wider effort to make people more aware of how to safely use level crossings and the dangers and consequences of misusing them. We don’t want to catch anyone breaking the law at a level crossing but those that do often put themselves and others at risk and can delay trains and incur cost to us and the tax payer. This announcement comes as Network Rail and British Transport Police support International Level Crossing Awareness Day (7 June). Around a dozen events are being held at level crossings across Britain, with community safety teams handing out leaflets, talking to users about how to safely cross the railway and inviting people to see the current camera vans in operation. Offenders live an average of 8.13 miles from the level crossing. The first of around 3,000 people moved into Network Rail’s new national centre in Milton Keynes on 11 June 2012, putting the city at the centre of Britain’s railway operations and helping cut millions of pounds a year from the cost of running the railway. The Quadrant:MK, as the new building is called, brings together teams from across the country under one eco-friendly roof, improving the way Network Rail coordinates activities to build a bigger and better railway. The move to Milton Keynes is part of a programme of structural reform of Network Rail which has seen day-to-day control of the railway devolved to local level and the creation of a new, regional infrastructure projects business. Sitting at the centre of Network Rail’s operations, the national centre will provide support to the routes and regions based in places such as York, Glasgow, Cardiff and Birmingham. Moving so many people to a single location will save Network Rail tens of millions of pounds a year in office rental costs, helping cut the cost of the railway and delivering better value for money for taxpayers and fare payers. The new building sits on the site of the former national hockey stadium, revitalising an underused corner of central Milton Keynes and providing a huge boost to the local economy. Many of the 3,000 people moving to the Quadrant:MK are existing employees who are relocating to the area. In addition, Network Rail is recruiting 700 new roles at all levels and across all functions. Half of the successful candidates to date come from Milton Keynes and Northampton postcodes. For those existing employees who have moved or are moving to Milton Keynes, a series of drop-in days, workshops, spouse support days and familiarisation tours have been put on over the last year to introduce people to Milton Keynes and all it has to offer. Network Rail has worked closely with a number of local stakeholders, notably Milton Keynes Council, to make sure people new to the area have all the support they need as well as information about housing, schools and leisure facilities. The 400,000 sq ft Quadrant:MK is at the forefront of new office developments in the country and is one of the most sustainable buildings in the country, with a combination of cutting-edge design and the latest environmentally-friendly features. The building is naturally ventilated with little reliance on air conditioning, uses recycled rainwater to flush toilets and draws power and heating from the local district energy scheme. Over the next three months, approximately 250-300 people will move into the Quadrant:MK each week, with the building fully operational in September. Metrolink services to and from Oldham Mumps are scheduled to open to the public for the first time on Wednesday 13 June 2012, subject to final testing. The first in-service tram to Oldham Mumps is scheduled to leave Manchester Victoria at 05.24 calling at all eight stops along the new line - Monsall, Central Park, Newton Heath & Moston, Failsworth, Hollinwood, South Chadderton, Freehold and Oldham Mumps (temporary). It will then become the first in-service tram to depart Oldham Mumps, leaving at 06.00. Journeys from Mumps to Manchester city centre will take around 25 minutes. Services will run every 12 minutes. A six-minute service will be introduced as patronage grows and capacity through Manchester city centre increases. Councillor Andrew Fender, Chair of the Transport for Greater Manchester Committee, said: "This is an historic day for Oldham and the Metrolink network. From next week, people will be able to make brand new journeys from brand new stops on brand new trams and tracks. For the first time, people will be able to travel to and from Monsall, Central Park, South Chadderton and Freehold on this line, so we are opening up new and exciting opportunities. Of course, Oldham is a brand new destination for Metrolink and I encourage everyone to take a tram ride to see all the great things the borough has to offer. Today also marks the latest stage of a massive expansion of the Metrolink network that will bring our trams to even more new destinations and open up even more opportunities for businesses and communities. It's a very exciting time but, like any major project, it is not without its challenges and I am grateful for the patience that has been shown as we work through them to deliver these new lines." Jim McMahon, Oldham Council Leader, said: "To have Metrolink up and running will be a hugely significant and exciting day in the history of our borough. The arrival of the tram has been a long time coming and we must make sure we keep to the agreed timetable for the town centre route as it is central to our future prospects. This is the biggest infrastructure project ever undertaken here and we believe it will act as a catalyst to create new jobs and opportunities. Work continues now on the town centre extension and Oldham Council is firmly focused on trying to deliver major improvements on that front. This includes the proposed redevelopment of the Old Town Hall, for example, plus the Hotel Future scheme and improvements to the public realm which will help us to forge a new family-oriented leisure economy. It is essential to our plans to get people to see Oldham differently - as a place with excellent new infrastructure and opportunities, but also a place that is 'open for business' and has a real commitment to making things happen." Tickets to any of the stops in Manchester city centre, up to and including Deangsate-Castlefield, start at £3.20 for a peak 'anytime' single from the Oldham Mumps-Failsworth stops, or £2.30 from the Newton Heath & Moston-Monsall stops. An 'anytime' return ticket for the same trip will be £4.80 from the Oldham Mumps-Failsworth stops, and £3.40 from the Newton Heath & Moston-Monsall stops. Off-peak (9.30am onwards) equivalents will be £3.50 and £2.80 respectively. Further savings can be made with special day, weekend, family and group passes, as well as longer term tickets, including weeklies, four-weeklies, quarterlies and annuals. Monsall, Central Park, Freehold and South Chadderton are all brand new destinations, while the stops at Mumps, Hollinwood, Failsworth and Newton Heath & Moston, which were served by the Oldham Loop until it closed as a heavy rail line in October 2009, have been completely rebuilt. Once complete, the decked car park at Hollinwood, which is currently under construction, will provide almost 200 park-and-ride spaces exclusively for the use of Metrolink passengers. Up to 100 spaces will be provided in the interim. As part of Metrolink's commitment to improving cycle parking facilities across the existing and future network, cycle stands are available at Freehold, Hollinwood, Failsworth, Newton Heath & Moston and Monsall, with cycle lockers also available at Freehold, Hollinwood and Failsworth. All services will call through Manchester city centre and then travel on to the South Manchester line, ending at St Werburgh's Road in Chorlton. Passengers can connect with services to Bury at Victoria and services to Altrincham, Eccles and MediaCityUK in Manchester city centre or at Cornbrook. They can also link up with bus services at Central Park and Shudehill, or heavy rail services at Manchester Victoria. Eurostar is introducing a new quiet coach facility on-board all of its trains for travel from September 2012. Passengers booking Business and Standard Premier tickets for travel from 11 September 2012 onwards can choose a seat at no extra cost in a dedicated quiet coach at the time of booking. This service is being introduced in direct response to customer requests for the option of a quieter environment in which to work or wind down during their journey. Transport Minister Theresa Villiers has praised the hard work of local people and organisations in developing the local rail network in Cornwall. The comments follow a tour of Truro Station, which is undergoing a £500,000 renovation as part of the National Station Improvement Programme, due to be completed by the beginning of July. Theresa Villiers MP said: "I am delighted to be able to announce that the Paddington to Penzance sleeper service will be included in the new franchise agreements.Together with the improvements to Truro railway station, this will provide a great service to rail customers. The improvements in Truro represent a significant and welcome investment in rail travel in Cornwall. I was also delighted to see the hard work put into the Maritime Line by the Devon and Cornwall Rail Partnership and the local community is paying off with a massive 91 per cent increase in passengers since 2007-8. This shows the value that local people and organisations can bring to developing the local rail network." Train service frequency, passenger numbers and train punctuality are now at record levels, borne out by the huge increase in demand in the area. Since 2006 passengers numbers have increased by over 54% on Devon and Cornwall branch lines and by 20% in the last year alone for the Truro to Falmouth branch line. Additional services have also been provided by First Great Western to meet rising demand. Working with Cornwall Council, the Devon and Cornwall Rail Partnership and local groups, it has added 650 seats on peak weekday services and 1,275 at weekends. National Express train operator c2c has been ranked the best train company in the country for the punctuality of its services, according to the official rail industry figures published by Network Rail. 97.2% of c2c trains were on time in the four week period ending Saturday 26 May 2012, according to the Public Performance Measure, the official rail industry standard for punctuality – the best score in the country. c2c has now finished top of the table for seven of the thirteen four-week periods in the past year. Over the year a total of 96.9% of c2c trains arrived on time – also the best score in the country. A world-famous North East anthem – the iconic ‘Blaydon Races’ – took to the tracks on 6 June 2012 as an East Coast Class 91 was named in honour of the song’s 150th anniversary. The East Coast electric locomotive, No. 91115, was named Blaydon Races in a special ceremony at Newcastle station. Former England and Newcastle United striker Alan Shearer joined ‘Queen of the Blaydon Races’ Sheila Shorrick-Dodds and East Coast’s Managing Director Karen Boswell at the naming ceremony. The song ‘Blaydon Races’ recalls a famous horse race held from 1861 in Blaydon, near Gateshead. The song focuses on the journey from Newcastle to the race, as well as on events during the race itself. Today’s train naming is one of the highlights of a series of events leading up to the 150th anniversary of the song on Saturday 9 June 2012. The train was sent on its way in musical style today by Tyneside band The Longsands, whose own version of ‘Blaydon Races’ has been recorded to raise money for the Sir Bobby Robson Foundation, a charity which supports the early detection and treatment of cancer. The ‘Blaydon Races’ song was first performed to a large audience by its writer, the noted concert hall composer and performer George ‘Geordie’ Ridley, in 1862. Fifty years ago, its centenary celebrations began with the crowning of Sheila Shorrick-Dodds (then Sheila McFarlane) as ‘Queen of the Blaydon Races’. Today Sheila joined East Coast Managing Director Karen Boswell to unveil the newly named locomotive. East Coast is offering a chance to win a full-size aluminium Blaydon Races nameplate – just like the one unveiled on 91115 – plus commemorative badges depicting the nameplate and complimentary First Class return travel for four between any two stations served directly by East Coast trains. There’s also a runners-up prize, including two of the specially-made ‘Blaydon Races’ enamel badges and complimentary First Class East Coast return travel for two. Email your answer to: blaydonraces150@eastcoast.co.uk no later than Wednesday, 20 June, including your name, address and contact telephone number. Entries will be judged by a panel including representatives of East Coast and the Blaydon Races 150 Anniversary Campaign organisers. Travel is to be completed by Wednesday, 31 October 2012. The Rail Accident Investigation Branch (RAIB) has released its report in which a passenger was trapped in train doors and pulled along a platform at London King’s Cross station on 10 October 2011. The accident occurred at 17.53 on Monday 10 October 2011 and involved a First Capital Connect service from London King's Cross to Royston. The passenger attempted to board the train whilst the doors were closing and her fingers became trapped between the doors whilst she was standing on the platform. The train then started moving and she was forced to walk, and then run, alongside the train until she was able to pull her fingers free after the train had travelled about 20 metres. The RAIB investigation identified that the passenger attempted to board the train while the doors were closing and then waited for the doors to reopen; the member of station staff responsible for checking that no-one was trapped in the doors did not carry out a visual examination of all train doors before permitting the train to depart; the train doors were designed in a way which did not facilitate the removal of small flexible objects such as fingers; and the driver did not stop the train immediately when the passenger alarm was operated (this had no effect on the outcome of the King’s Cross accident, but similar action could affect future incidents). Recommendations. As a consequence of this accident, the RAIB has made one recommendation in that the owner of the train should review the design of the type of door involved in this accident in order to assess the practicability of modifying the seals on the edges of doors to reduce the risk associated with trapping of objects and people. The RAIB has also identified two important learning points for the railway industry: train dispatch arrangements should always include visual inspection of all doors; and trains must be stopped immediately if the passenger alarm is operated as the train is leaving the station. A unique 1930s water tower, which is also a Cardiff landmark, is to be transformed by Network Rail. The concrete water tower outside Cardiff Central (Caerdydd Canolog) was built by Great Western Railway in 1932 as part of its redevelopment of the station. Now Network Rail is to repaint the structure in the original colours of the GWR. The tower, with its concrete fluted base and a cylindrical water tank, has no comparable GWR structures. As a result, it is grade two listed, both on its own merit but also as part of the larger station complex. Cardiff Central itself is regarded as the most complete 1930s GWR station still in existence. By painting the tower in GWR colours, it will link it to the already restored buildings and provide a fine impression for visitors arriving in the Welsh capital by rail. 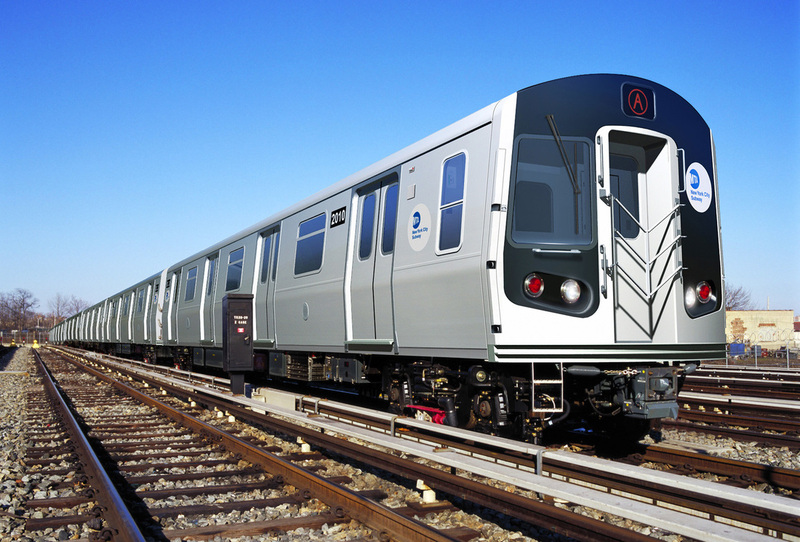 Bombardier Transportation has announced that it has signed a contract for 300 subway cars with the Metropolitan Transportation Authority (MTA) to be delivered to New York City Transit (NYCT). The order is valued at approximately $599 million US ($623 million CDN, 482 million euro). The MTA Board of Directors approved the award of a contract to Bombardier on 28 March 2012. The new cars (known as the R179 series) will be built at Bombardier’s fully-integrated manufacturing plant in Plattsburgh, New York. The Plattsburgh facility is located in New York State’s North Country region and is Bombardier’s Centre of Excellence for rolling stock production in the United States. In operation since 1995, it has produced more than 3,000 passenger rail cars and locomotives now in service across the United States. The R179 cars will incorporate state-of-the-art technology from Bombardier. The cars will be powered by highly reliable Bombardier Mitrac propulsion equipment with new, energy-efficient inverters. The cars' onboard systems will be integrated by Bombardier's industry-leading Mitrac train control and management system with internet protocol technology. The propulsion and control equipment will be supplied by Bombardier's Propulsion and Controls business unit in Pittsburgh, Pennsylvania. Delivery of 10 pilot cars is scheduled to take place in the third quarter of 2014, followed by delivery of the remaining production series cars between mid-2015 and early 2017. Bombardier has redefined the future of mass transit travel. Around the world, more than seven billion people use Bombardier subway cars every year, from Boston, New York, Montreal, Toronto and Mexico City to London, Paris, Berlin, Delhi and Shanghai. Bombardier’s current North American orders include 706 new subway cars for Chicago, 468 cars for Montreal, and 420 cars for Toronto. NYCT – one of six operating agencies that make up the Metropolitan Transportation Authority of New York – is the largest public transportation agency in North America and one of the largest in the world. The subway has a daily ridership of more than five million people, and an annual ridership close to 1.6 billion people. Its fleet of 6,380 subway cars travels almost 345 million miles a year along 660 miles of track, 24 hours a day, seven days a week. Eurostar is offering its customers a range of sizzling offers for travel this summer, with the release of thousands of extra £69 return fares and from the 15 June, a 30% discount on all Standard Premier bookings. Hot on the heels of one of Eurostar’s busiest weekends this year with 10 extra services over the extended Jubilee bank holiday, the high-speed operator is now unveiling two extra special offers throughout the summer months – one for cost conscious travellers and another for those looking to splash out and treat themselves. Between 7 and 9 June 2012, almost 200,000 additional £69 fares to Paris, Brussels and Lille will be available for holidaymakers up and down the country looking for a good value break, for travel between July and September. To book tickets passengers simply need to check the £69 fare availability finder on eurostar.com and select their travel dates. For those travellers looking to treat themselves, Eurostar is also offering a 30% discount on Standard Premier bookings made between 15 and 26 June 2012 to Paris, Brussels and Lille, for travel between 16 July and 31 August. The 30% discount will automatically be applied to the selected fare at the time of booking. ‘Eurostar Plus’ is a collection of exclusive discounts and offers available to all Eurostar travellers and includes deals on entry to museums, art exhibitions as well as generous shopping discounts. For example, with ‘Eurostar Plus Culture’ travellers simply show their Eurostar ticket to receive 2-for-1 entry into paying exhibitions at selected top museums and galleries in Paris, Brussels and Lille. A £40m plan to boost rail services in West Wales has been given the go-ahead with permission granted to replace a bridge on the main route between Swansea and Llanelli. The plan will see the redoubling of six miles of track between Cockett West Junction and Duffryn West Junction, the re-instatement of the disused platform at Gowerton station, and the replacement of the Loughor viaduct. Funding is split between Network Rail, which is paying for the £16m viaduct works, and the Welsh Assembly Government, which is behind the track redoubling. The grade two listed Loughor viaduct has to be replaced as it can only bear the weight of one train at a time. Listed building consent for work on the structure was received from Carmarthenshire Council on Thursday, 31 May and preparatory work will continue on site with the intention of opening a new bridge in mid-2013. Network Rail is going to preserve some elements of the original viaduct and will rebuild two of the original spans on railway land to the west of the existing structure. It will also carry out a full photographic survey, so a record of the viaduct is available for future reference. As the Loughor Estuary is a site of special scientific interest, the work has been planned in close communication with the Environment Agency for Wales and the Countryside Council for Wales to minimise any impact on the environment. Two platforms will be installed on either side of the bridge to effectively turn the structure into a quayside. This will then allow a barge to be floated up the estuary to tie up next to the bridge. Another barge will be lowered in from the other side of the bridge. These will then sink pilings into the bed of the estuary so construction can continue around the operating railway. All spoil will then be taken way, rather than pumped back into the water, protecting wildlife. Thanks to the way the new structure will be built alongside the existing viaduct, the railway will only have to be closed for an estimated three weeks – planned for Easter 2013. By that stage the foundations for the new structure will be in place in the estuary, with the replacement bridge deck next to the original, ready to be slid into place. First Great Western has announced it will run an additional evening return service on the Severn Beach Line between Bristol Temple Meads and Avonmouth, from September 2012. Passenger numbers on the line have risen by 30 per cent in the last two years, with many trains gaining extra seats earlier this year to meet the increasing demand. Operating each weekday and on Saturday evenings, the service will leave Temple Meads at 21.37 and call at all stations to Avonmouth, arriving at 22.03. The return service leaves Avonmouth at 22.17 and will call at all stations to Bristol Temple Meads, arriving at 22.48. The new service will begin from Monday 17 September 2012. MP for Stroud Neil Carmichael has officially opened the improvements at Stroud station. Train operator First Great Western invested £150,000 in new toilets, improving the station facilities for customers. The opening of the station improvements comes just a week after First Great Western joined Stroud Chamber of Commerce in launching the new Stroud Special ticket. Rail passengers are benefitting from a £600,000 project to improve facilities at Effingham Junction station, which was officially opened on 31 May 2012. The work includes a new, modern brick and flint station building, improved station access and a more accessible footbridge and footpath. Passengers with disabilities will also benefit from the new ramp on the Guildford bound platform and a low level ticket window in the booking hall. The joint project, which was delivered under the Government's National Station Improvement Programme, involved a partnership between the Department for Transport, South West Trains and Network Rail. Tim Shoveller, Managing Director of the South West Trains-Network Rail alliance, officially opened the new-look station. Set close to the leafy village of Effingham, the old wooden station building has been demolished and a new building has been built which complements the historic buildings in the surrounding area. Effingham Junction has already benefitted from new waiting shelters on each of the two platforms. As part of the overall scheme, a wheelchair accessible toilet, a new pick-up and drop-off area, and extra customer information screens were also installed. As part of South West Trains’ commitment to delivering greener travel, facilities for an additional 16 bicycles have also been added. Customers will soon be able to connect to the internet at Tube stations across the Capital. Stations including Oxford Circus, Stratford, Liverpool Street, Leicester Square and King's Cross will be among the first to launch, with around 80 stations WiFi enabled by the end of July. With the eyes of the world on London this summer, Virgin Media's next generation WiFi service will be made available to all Tube passengers for free throughout the summer. Millions of commuters and visitors to London will be able to get online at Tube stations and find their way around the Capital with up-to-the-minute TfL travel information, access social media while they wait for their next train on the station platform or browse the web to discover the very best London has to offer this summer. Virgin Media and London Underground engineers continue to test and prepare the forthcoming WiFi service, including recent capacity testing at Chancery Lane underground station where hundreds of devices were connected to the station's WiFi service at exactly the same time to reproduce the service experience of a busy Tube train arriving at the station. The new free online portal will offer up-to-the-minute TfL service information including TfL's journey planner and entertainment and news content useful for a commute to work or trip into town. DB Schenker Rail (UK) Ltd is seeking eight apprentices from across the UK to become operational rail freight leaders of the future. This is the second year in a row that DB Schenker Rail UK has run an apprenticeship scheme, making it an established route for young people to start a career with the company. A full training programme will be provided for the successful applicants, lasing two years for assistant production manager apprentices and three years for operational management trainee apprentices. The locations where apprentices are sought for are: Acton, Bescot, Dollands Moor/Hoo Junction, Doncaster, Knottingley, Mossend, Newport and Westbury. Starting salaries are £12k for operational management trainee apprentices and £25+k for assistant production manager apprentices. Alain Thauvette, Chief Executive of DB Schenker Rail UK, said: "The railway industry constantly evolves and recruiting young talent to join it is extremely important. These apprenticeship opportunities will allow successful applicants to get onto the railway, learn about this industry, and find out what it needs to deliver for its customers while receiving professional training. We look forward to starting the careers of eight exceptional young people later this year." The closing date for applications is Sunday 15 July 2012. Northern Rail is now connecting even more passengers from Garsdale to Leeds with the welcome introduction of an additional morning stop. Leaving Carlisle at 05.50, the service calls at Garsdale at 06.59, offering customers for the first time, a connection into Leeds before 09.00. The Friends of Settle and Carlisle Line have long hoped to reconnect the area with the city of Leeds early in the morning and the service has now been in place since the beginning of May. The service leaves Carlisle at 05.50, calls at Garsdale at 06.59 and arrives into Leeds at 08.37. South West Trains passengers are benefitting from further improvements to the safety and security of their station, with an additional 28 stations being awarded secure station accreditation. The secure station accreditation scheme is led by the British Transport Police in conjunction with the Department for Transport. It is a national scheme designed to recognise measures taken to improve station security and reassure passengers and staff that consistent efforts are being made to deter crime and anti-social behaviour. Making the grade, the latest South West Trains stations to achieve the secure mark include: Alton, Andover, Ascot, Barnes, Cobham & Stoke D’Abernon, Dorchester South, Farnborough, Farnham, Godalming, Havant, Hounslow, Mortlake, Norbiton, Petersfield, Southampton Central, Strawberry Hill, Whitton, Winnersh, Basingstoke, Brentford, Fratton, Portsmouth & Southsea, Windsor & Eton Riverside, Kingston, Portsmouth Harbour, Raynes Park, Richmond, and Teddington. As part of the accreditation, the stations were audited by the British Transport Police. These stations join more than 100 other stations on the South West Trains network that have been accredited with secure station status. This means that 95% of passengers now travel through stations that have met the strict security criteria set down through this scheme. Tim Shoveller, Managing Director of the South West Trains and Network Rail alliance commented: “Although crime on the railways is at an all time low, we are continually looking at ways to make our trains and stations safer. We remain committed to invest over £50m in our stations over the duration of this franchise, as these provide a gateway to our rail services.